What can I expect from my float? Our aim is to deliver complete relaxation. Firstly, you’ll be welcomed by our professional staff. We’ll explain briefly how the pod works and show you where to switch off the internal pod-light to get the full effect (it’s entirely your choice to leave it on or off). Then, we’ll leave you to shower and step into the pod. Once you’re in the pod you simply lower the overhead door, lie down and relax. The water is shallow and, try as you might, you won’t go under. Relaxing music will be piped into the pod and when you’re ready simply press the button to switch off the light. 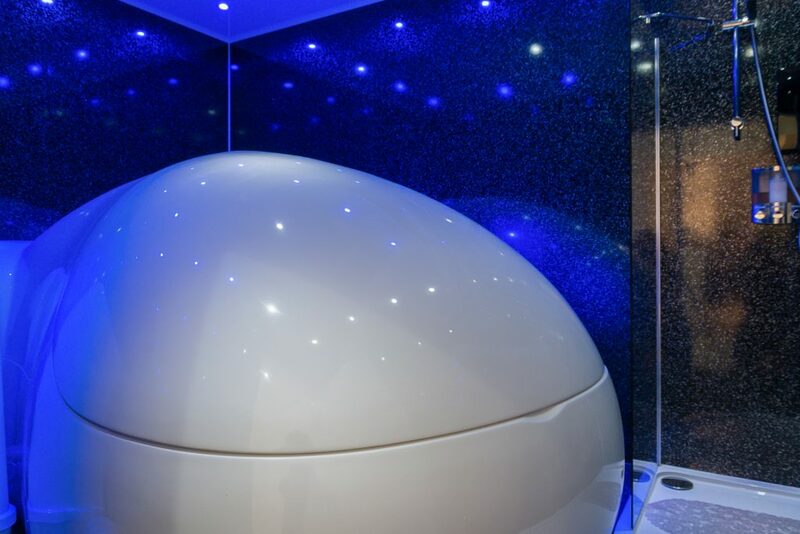 During your float time you’ll feel completely weightless and will love the zero-gravity effect floating brings. Your muscles and joints will ease off and you can stretch out to completely relax. Once your hour is almost up, gentle music will quietly start playing again, you can switch on the light, lift-up the pod hatch, emerge fully refreshed, shower to wash off the salts and go on to enjoy your day feeling completely invigorated. The floating solution is a mix of water and high ratio of superior medical grade Epsom salts – magnesium sulphate – which has been proven to help relieve stress and muscle cramps. Will I be bathing in someone else’s water? This is, understandably, a common question. The answer is no – our bookings are always 90 minutes apart which includes a 1-hour float and 30-minutes for a fully-automated water / solution change. I suffer from claustrophobia; will this be a problem? The pod is probably larger than you may imagine. At over 8ft long and 5ft wide it’s big enough for you to totally stretch out without feeling restricted in any way. The overhead hydraulic door doesn’t lock and will open with the slightest touch. However, if you prefer, you can choose to leave it open as you’ll be in a private float room where you won’t be disturbed. Most people find when that once they get used to the calm peaceful environment they’re more than happy to close the door, switch off the light and immerse themselves in the full experience. If you’d like to see our pod before booking your float however, just call us and we’d be delighted to show it to you. How many floats are needed for it to be effective? The key to a really enjoyable float is to completely relax and immerse yourself in the moment. As our brains are bombarded with so much external stimuli every minute of every day, it can sometimes be difficult to switch off straight away. However, floating is a meditative experience and like any other forms of meditation it takes practice. We therefore recommend at least three sessions as the more you do it the more relaxing and therapeutic it becomes. To find out more about floating, read our page on the Benefits of Floating, find out about our Sessions & Costs or click here to BOOK NOW!